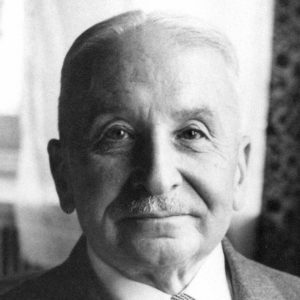 Even though Ludwig von Mises was already a member of the third generation of the Austrian School of Economics, he still studied under Eugen von Böhm-Bawerk and Carl Menger. His groundbreaking works on monetary economics and credit found recognition in practical affairs quite early and held back inflation from running out of control – like it had happened in Germany – in Austria in the 1920s. He showed that supply and demand determine not only the price of goods and services, but also the price of fiduciary media, i.e. money. In 1927 Mises, together with Hayek, founded the Austrian Institute for Business Cycle Research, which’s aim was not only the scientific explanation of fluctuations in economic activity, but also the promotion of entrepreneurship in the young country of Austria. Later works include a detailed analysis of socialism, which’s conclusion held that there can be no rational economic calculation in socialist societies, since there can be – because of lacking property rights, no prices for means of production. After the breakdown of Soviet-style socialism in 1989, those ideas have of course become more relevant than ever before. During WW2, Mises fled to the United States of America and continued his career there. One of his biggest successes came with the publication of his monumental book “Human Action”, in which he aims to reconstruct the whole existing body of economic theory and reintegrate the concept of individual human action to its corpus.